"Norman is a 14-month-old Schnese who is mostly black with a few silver highlights. Norman stands 10 inches tall at the shoulders and weighs about 15 pounds. His mother is a purebred black Mini-Schnauzer and his dad is a black and white Havanese. The Schnauzer genes prevailed. Norman is clever, active, intuitive and eager to please. He loves to play ball, take walks and chew rolled rawhide. His favorite trick is to roll over for a treat. He was easily potty trained, but he has destroyed several sets of door blinds "asking" to go outside. One quirk he has is chewing and swallowing things he shouldn't such as entire pencils, screws and plastic objects. So far, no trips to the doggie emergency room have been required. Norman is professionally groomed with a Schnauzer style about every other month. His cutest feature is his eyebrows. He has two Havanese half-brothers who come to visit and it's amazing how unlike them he is. He is a wonderful adult companion dog and all-around good guy." The Schnese is not a purebred dog. It is a cross between the Havanese and the Miniature Schnauzer. The best way to determine the temperament of a mixed breed is to look up all breeds in the cross and know you can get any combination of any of the characteristics found in either breed. Not all of these designer hybrid dogs being bred are 50% purebred to 50% purebred. It is very common for breeders to breed multi-generation crosses. Ralph the Schnese puppy at 6 months old— "The picture of Ralph in the grass was taken when he was only 6 months old. His mom is a purebred Mini Schnauzer and his dad a purebred Havanese. Less than a year later, his hair changed from a thick black coat to a beautiful, soft silver that is striking and unique. At two years old, he weighs a healthy 18 pounds and has a very calm and obedient temperament. He is very good with children and loves to play with other dogs." 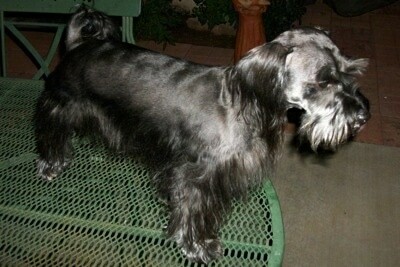 "This is a hybrid with a purebred Havanese sire and a purebred Mini Schnauzer dam. He is 8 weeks old at the time of the picture. His name is Ty. He is 2 pounds in these pics and is expected to get to just over 10 pounds full grown. He has a lap dog mentality...very calm and VERY easy to crate train!" Ty the Schnese (Havanese / Mini Schnauzer mix breed) at 8 weeks old, weighing 2 pounds and getting a kiss!